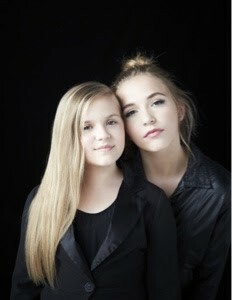 Musicians and actresses Lennon & Maisy Stella (Maddie and Daphne) from the ABC TV show Nashville are sisters in real life and pretty much the cutest things I’ve ever interviewed. I simply adore them. These girls are just 16 and 12 and, of course have their own YouTube channel. They’ve performed at The White House, on Good Morning America, The View – and even presented Taylor Swift with a CMA Award! Last year, they released a children’s book, “In the Waves,” and have even been to New York Fashion Week (hello, duh). I had the opp to ask them just a few questions this week about all of their projects – check it out! I Heart Heels: Being musicians yourselves, who do you like to listen to? Lennon and Maisy: We honestly love listening to all genres. Maisy is a little more on the pop side and Lennon loves Indie. IHH: Have to ask. What was it like presenting an award to Taylor Swift? L&M: Presenting an award to Taylor Swift was amazing – and she is absolutely the sweetest! IHH: And as actresses, which actresses do you look up to? L&M: Being on the show, we honestly learned so much from the cast and look up to all of them greatly. IHH: Where are your top 3 fav places to shop? L&M: TopShop, any thrift store, and Urban Outfitters. IHH: What do you love the most about working on Nashville? L&M: We love learning from the cast as both as people and actors. IHH: How do you stay connected to fans with your busy schedules? L&M: We are always trying to stay as connected as possible – and give a ton of virtual love! Share the post "Lennon and Maisy Stella of ABC TV Show Nashville Spill On Where They Shop"
Whiny Wednesday: Little Giraffe Luxe	How I Wore My Heels: Go Bright for Spring!